The program aim to improve the quality of education offer to children from farm families. 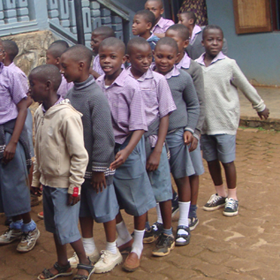 Our target ambition is to reach 15000 children mostly in Cameroon within five years. We have started the first pilot was with St. Theresia School Bamessing. Assisted to create more conducive learning environment by constructing a multipurpose rooms in the schools where children can read and do group work, we offer basic text books in English, French and Mathematics including teaching aids to encourage active teaching method. We additional provided a sport equipment package so that the school can better stimulate education using sport. Report of this project will be available online soon. This school lack a toilet and children sit under the son for lesson in dry season and in the raining season, classes are share. We planned to construct a modern toilet, two addition classrooms and an office in the school as well as offer a sport packet to be used in stimulating education with sport. Lesson learned from the pilot is that children are leaving other schools in the village to benefit from access to books provided at the St. Theresia School. To avoid expected consequences, we planned to set up a community revolving book system in the village.